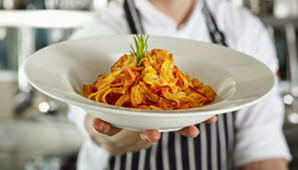 Red, tomato-based and incredibly savoury. You may mistake this for Mexican salsa, but this Indian staple relish is not your average taco pairing. This spicy tomato chutney is a brilliant side dish and dip for your Christmas cheese platters and cold meats, sandwiches, and even BBQs. It lasts for ages in storage and makes a great addition to your list of edible gift ideas this holiday season. Chutney, pronounced “chut-nee”, is a versatile South Asian condiment that is made from a wide variety of ingredients usually from a concoction of fruits, vegetables, and spices. In India, chutneys are served with almost every dish, particularly curries, but also as sauces for meats. It is believed there is no right or wrong recipe for this dish. They can be fresh or cooked, thin or chunky. They also range in flavour from sweet to sour to spicy or a combination of these. It is often used to balance a dish: the strong flavour of chutneys with beef, chicken and pork; and sweeter versions for bagels, breakfast toast, cheese and crackers. 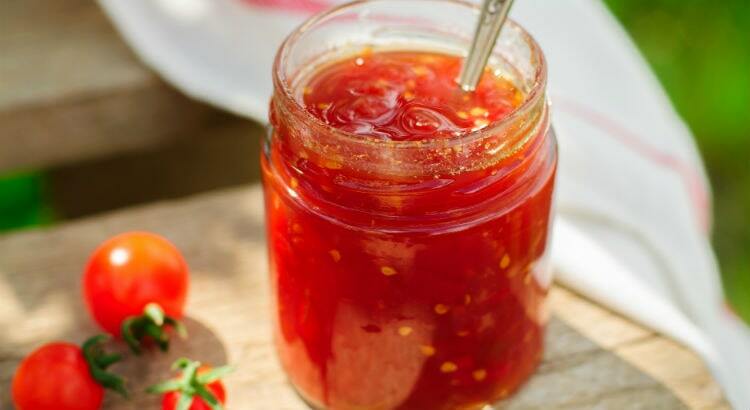 Inspired by the British version of chutneys, this tomato chutney recipe comes with a spicy, hot kick and is made with vinegar as a natural preservative. Store it in a jar and pack it in a gourmet picnic essential hamper to make a perfect gift this Christmas. Place a large pot of water on the stove and bring it to a boil. While waiting, rinse your tomatoes clean and remove any stems that are still attached to them. Slice a shallow X at the bottom (opposite side of the stem root) for easy peeling later. Gently drop your tomatoes into the pot (one after another or several at once) and boil for one to two minutes. When skin starts to loosen up, transfer tomatoes into a bowl of iced water until cooled and peel then chop. Combine chopped tomatoes and brown onions into a mixing bowl. Sprinkle with salt then mix. When done, cover your bowl with plastic wrap and leave it at the countertop overnight. Pour out all the liquid from your bowl in the morning. Transfer your chutney in a large pot and cover with white vinegar. Add sugar and boil for 5 minutes. In a separate bowl, combine all spices and mix. Pour into the boiling pot and stir to add flavour to your chutney mixture. Cover your pot with lid and boil gently for an hour while removing scum and stirring frequently. To thicken the chutney, add cornflour to a little water and mix to a smooth paste. Add a little of the hot liquid from the relish mixture until the consistency is like thin cream. Add paste to chutney mixture. Stir chutney mixture for about 5 minutes until it thickens. Bottle the spicy tomato chutney into hot sterilised jars and seal once cooled. This recipe fills up to 10 jars. I am a bit confused as to the use of the onions in the recipe. Hi Kathleen, It should be 1.5kg of brown onions only. We’ve corrected the ingredients list in the recipe. Hope you give it another go. Question: When is the 1 x peeled and chopped onion used, it is not mentioned in the Instructions? Hi Diane, We’ve corrected the ingredients list and retained the 1.5kg of brown onions to use for your mixture. Thanks for pointing this out. Hope you try this recipe at home. How long will it last for once jarred? If stored well in the fridge once opened, jarred chutney will last up to one year. Hope you give this a try this Christmas!